The Hamilton Beach The Scoop Coffeemaker goes where no coffeemaker has gone before, brewing hotter, faster and better-tasting coffee than most gourmet machines out there. 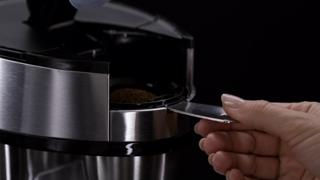 Its benefits don't stop there — this single-cup coffee maker utilizes the simplicity of ground coffee and brews a customizable cup quickly: an eight-ounce cup in less than 90 seconds or a 14-ounce travel mug in under two-and-a-half minutes. Aside from its versatility in using inexpensive coffee grounds to brew a great-tasting cup, this Hamilton Beach coffeemaker is designed for ultra-simple preparation in three straight forward steps: scoop, place and brew! It features a steel mesh scoop for filtering freshly ground coffee and comes with a built-in, adjustable stand that flips to accommodate a standard-size cup or a taller travel mug. All in all, this coffeemaker offers affordability and no fuss with lots of options. There's no need for extra equipment or high-tech buttons. Hamilton Beach The Scoop Single-Serve Coffeemaker, 49981, Stainless Steel:Brews cup quickly: an 8 oz up in less than 90 seconds or a 14 oz cup in under 2.5 minutesUltra-simple preparation: scoop, place and brewSteel mesh scoopBuilt-in, adjustable standFits a cup or travel mugWide drip tray on baseSettings for Regular and Bold coffeeBrews hotter for better tasteDurable stainless steelAutomatically shuts off after brewing1-year limited warrantyModel# 49981 The Hamilton Beach The Scoop Coffeemaker goes where no coffeemaker has gone before, brewing hotter, faster and better-tasting coffee than most gourmet machines out there. Its benefits don't stop there — this single-cup coffee maker utilizes the simplicity of ground coffee and brews a customizable cup quickly: an eight-ounce cup in less than 90 seconds or a 14-ounce travel mug in under two-and-a-half minutes. Aside from its versatility in using inexpensive coffee grounds to brew a great-tasting cup, this Hamilton Beach coffeemaker is designed for ultra-simple preparation in three straight forward steps: scoop, place and brew! It features a steel mesh scoop for filtering freshly ground coffee and comes with a built-in, adjustable stand that flips to accommodate a standard-size cup or a taller travel mug. All in all, this coffeemaker offers affordability and no fuss with lots of options. There's no need for extra equipment or high-tech buttons. Instructions: 1. Scoop. 2. Place. 3. Brew. The best idea for single cups of coffee and tea. We own a Kuerig, and a percolator. Yes, we like coffee. The Kuerig we have is ok, but I am frugal and was really tired of paying too much for those little plastic pods and then throwing away so much plastic. We tried several different re-usable plastic inserts, to allow us to just add coffee grounds instead of buying the pods, but the taste just wasn't there. We love our percolator coffee, but a lot of the time, we just want one or two cups. 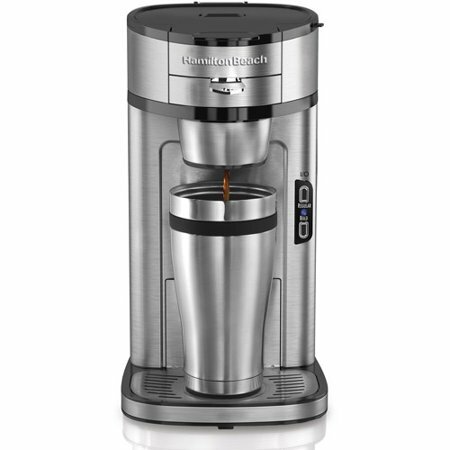 This Hamilton Beach "The Scoop" coffee maker is perfect for our needs. Its easy to use, easy to clean and it looks good on the counter top. The reusable filter is great and there is nothing to throw away except for the used coffee grounds. We also like that we can make 8 or 12 ounces of coffee at a time. We also use it with loose tea. I only wish I had purchased this instead of the Kuerig. Once we use up the various pods that we already have, we will be getting rid of it and using this Hamilton Beach for all our single cups of coffee and tea. I needed a single-serve coffee brewer for my piano studio. This meets my needs perfectly; it is small, simple, easy to clean, uses regular coffee grounds, has its own filter, and fits any mug I might choose to use. It shuts off as soon as the coffee is made, so I don't have to worry about it accidentally leaving it on. It dispenses right into my thermal mug that I like to use, which I then place the lid on it and I don't have to worry about spills. It cost more than I would have liked to spend, but there really was no other coffeemaker that I could find that had the exact features I needed. I expect that over time I will save enough money not buying special pods or filters so that the savings will offset the initial cost of the coffeemaker. I first tried this product at my daughters house and I enjoyed how the coffee maker was so easy to use . When I came back to New York but I wanted to purchase the same one she had and I found that it was very convenient for me to have around. In the morning I have to hurry up to get to work so I put this coffee machine very quickly and by the time I come back to get my cup it's done and ready . it's very simple makes one big large cup and all I do is press one little button I'll still have two coffees scoops that I didn't get with any of the coffeemakers . I have no regrets making this purchase . After much research, I purchased this coffeemaker to use when my brother visits. I drink decaf and he does not. If one of us was using the 12-cup coffeemaker, the other would have to wait or pour their coffee into a thermal carafe so the other of us could use the coffeemaker. Problem solved with "The Scoop". I love this coffeemaker. It is simple to use and performs exactly as stated in the user manual. The coffee is hot and tastes good. Clean up is a breeze. My only suggestion is to use a paper filter if you don't like a bit of "sludge" in your coffee. I cut little circles out of a larger filter and use it in the secondary filter underneath the filter basket and it works great. I have noticed that small filters are sold for making your own K-cups but my solution works just as well. I couldn't be happier with this coffeemaker. I live in a small cottage, so I needed a coffee maker that doesn't take up space. It took me a while to get it to taste just right, because I use to make 20 oz. cups in my Keurig (which broke, causing me to press "brew" 4-5 times to get one 20 ox. cup). I make the bigger size (14 oz) cup in the Hamilton Beach The Scoop Single-Serve Coffee maker, and I use the "bold" selection so the water flows through the coffee slower. I use much less coffee to make a cup. I like that you can hang the scoop/filter on the side of the maker to let it dry and to not misplace it. I also like the double filter. It barely leaves any grounds on the bottom (more like a tiny bit of coffee dust) in the bottom of my cup. I can drink all but a couple drops of the coffee. I'm currently using a very finely ground coffee, so I bet it wouldn't leave anything in the bottom of the cup if I used a more coarsely ground coffee. It brews quickly too. I like mine so much that I decided to buy one for my daughter-in-law. She lost her husband last year & was always throwing out coffee. She is also a tea drinker & will use it for that also. I use mine to make decaf for my husband & I can use my larger pot to make coffee for my grandson & myself. I have not had any trouble with mine works great. I am satisfied with the quality & the appearance; but feel it is a little pricey. Does exactly what we bought it for. We've only had this coffee maker for a few weeks but so far we've been happy with it. It does what we bought it for - it makes one cup of coffee quickly. My husband is the one who uses it and he had to kind of play with the regular and bold settings and the amount of coffee to put in the scoop until he got the right amount. We read several reviews before purchasing which was very helpful. I wish I could remember the name of the reviewer who was most helpful. They gave very detailed information about their experience and what to expect. Like they said, most of the negative reviews are likely from people who don't read and/or follow the instructions. We did read and follow the instructions and have had no problems. I think the main thing to understand and remember is that the coffee grounds go in the scoop and not the filter below it. If you don't follow those instructions you WILL end up with grounds in your cup. THIS IS IDEAL FOR MAKING SINGLE CUPS OF COFFEE. BOUGHT THIS AFTER MY OLD COFFEEMAKER QUIT ON ME. GREAT PRICE AND VERY QUICK SHIPMENT TO MY FRONT DOOR. THIS SOMEHOW MAKES A MUCH BETTER TASTING COFFEE THAN MY OLD MACHINE AND I USE THE SAME COFFEE IN THIS AS I DID IN THE OLD MACHINE. CLEANUP TAKES ABOUT 2 MINUTES AND ALL THAT CHROME MAKES IT LOOK MORE EXPENSIVE THAN IT IS. I WAS A LITTLE DISAPPOINTED THAT IT DID NOT COME WITH A LARGE MATCHING COFFEE CUP SO I AM USING MY OLD CUP THAT DOES NOT QUITE MATCH THE DECOR. IT DOES COME WITH TWO SCOOPS AND HAS A HANDY NOTCH ON THE SIDE TO HANG YOUR SCOOP AND KEEP EVERYTHING TOGETHER. VERY QUICK IN PRODUCING A HOT, GREAT TASTING CUP OF COFFEE. HAS NO ALARM TO TELL YOU ITS READY. VERY EASY TO SWITCH FROM LARGE TO SMALL COFFEE CUPS. ONLY USES LOOSE COFFEE, BUT I SUPPOSE YOU COULD CUT OPEN PREPACKED CUPS AND POUR INTO THE SCOOP. IT DOES WHAT IT WAS DESIGNED TO DO VERY WELL. GETS MY RECOMMENDATION. This is functional and the coffee comes out tasting good. There are two baskets, one to filter the grounds and one just below, which catches some of the finer sediment, but a bit still gets through. The tray for the coffee cup only has two positions, level with the bottom, or flipped over, which equals about 3 inches. I use a gourmet, finer coffee so need to use the Bold brew, and it comes out just fine. I found, if I flip the tray over, to the highest setting, I cannot fit a regular coffee cup under it, and at the lower level, I have to use a tall travel mug, otherwise it splatters. But, with a couple adjustments, it works great! Boy... is this thing overrated! OK... we wanted a single-serve coffee maker that would use regular grounds. After reading the reviews here, we decided to take the plunge and purchase this one. Well, I will start with the good or at least the adequate things about this maker. First, it's attractive for what it is. Secondly, it does brew very fast. Thirdly, the cost isn't bad. Now for the bad and the ugly... First, it is a pain to clean. You have to clean the scoop, the scoop holder and the main basket along with the cover than holds all of it in place. The seal MUST be wiped each time of you risk the thing not brewing correctly the next cup. Secondly, it DOES splatter no matter what size cup you use or how you position it. No matter what anyone else says, my wife will attest to the splatter mess it makes each and every cup! The cup holder has only one upper position which is simply inadequate. I used a cup that overlapped the basket height to try to reduce the splattering (which it did some) but then if you make a full cup, you can't angle it enough to get it out from under the basket without spilling it. So you are forced to use a cup that's just below the basket which leads to more splattering (unless you want less than a full cup of coffee that is). The cups I used were 12 oz. and 14 oz. The 14 oz. is too tall. The 12 oz. was a good height, but didn't eliminate the splattering. If you use a regular 8 oz. cup, forget about it... you will have more splattering. Thirdly, and lastly... the water is heated so fast that it's not as hot as a conventional coffee maker. So, you better heat your cup or at least run hot water in it if you want your coffee to stay at a good temperature. One bit of advice... if you get this item, this may help you a little bit. I like a strong cup of coffee, not "espresso" strong, just a good hearty cup of coffee. I found that if I used regular/coarse ground coffee, I got a weak cup of coffee on regular brew. It got a little stronger if I brewed it on strong though. I also used a premium fine ground coffee and found that it takes less coffee to make a good cup, but, be prepared for the fine "dust" that will be in your cup along with the oils from the premium blends. The "micro filters" are metal and are NOT fine enough to remove the "dust" grounds from the premium brand coffees. And oh, BTW, if you are accustomed to having more than one cup of coffee at a sitting, then you will NOT want this item. It's simply not worth the hassle, at least to us. Overall, we were so disappointed in this little maker that we returned it to our neighborhood store. We would NOT recommend this to anyone unless you like to clean your counters, clean the entire maker between cups, and don't care about the overall quality of your java. Other than those things, this thing was OK!